Helen Ross (centre) with members of her team of domestic housekeepers, together with Jim Watson (second right) and his technicians. 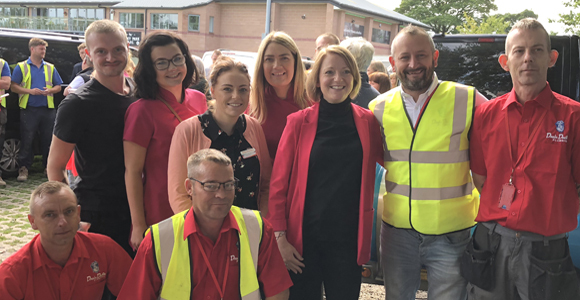 Franchisees from Drain Doctor and Bright & Beautiful have donated their services to adapt a family home in North Shields for the BBC television programme, DIY SOS, which helps homeowners improve their property following a change in circumstances. Nick Knowles. The programme, which is due to be broadcast later in the year, involved Drain Doctor carrying out a CCTV survey of all drain lines in and around the property. Its technicians then supplied, installed and rerouted new drainage and manholes at the rear of the property, which was vital to allow the new foundations to be installed for a rear extension. With a team of 12, the domestic housekeeping service Bright & Beautiful, carried out a thorough clean of the property prior to the family moving in. Drain Doctor and Bright & Beautiful are part of Neighborly, one of the world’s largest companies of franchised trade service brands.